Prefabricated Modular Office Partitions, Commercial Wall Dividers & Installation Services. In a modern business environment, flexibility and the ability to adapt to changing market conditions are essential if your company is to grow and prosper in line with your ambitions. With this in mind, the conventional office model of specific areas given over to specific departments separated by wall dividers is no longer possible, and over the space of a couple of years, the pace of change can mean that some parts of the company grow, while others inevitably shrink to make the best use of resources. With this in mind, it has become more and more important for businesses to be able to change the infrastructure of their office space in order to accommodate changes to the workforce. By using prefabricated modular office partitions throughout your office space, it is possible to transform the way your business functions. 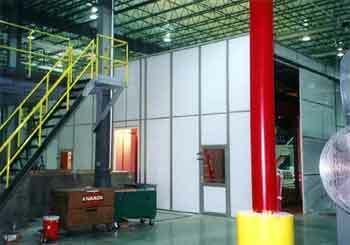 These removable dividers can be fixed into place in around half the time of a conventional wall, minimizing intrusion into work time during a reorganization of the business, and allowing staff to get on with their work. A wide variety of different office partitions are available to choose from, offering you the ability to lay out your work place in exactly the way you want to. The partitions fix into place using the exterior walls, ceiling supports, and each other to create a pleasant working environment that is able to split open plan office space into discrete areas where staff working together can interact easily without disturbing other staff. One of the great advantages of using office partitions rather than conventional walls is that it is eminently possible to add additional functionality to your space without major construction. Meeting rooms, training areas, and even executive offices can be installed quickly and easily by trained staff, and because the dividers are reusable, the layout of your office can be transformed over and over again using the same materials. From an operational point of view, having staff working on the same project or team located close together means that they are much more able to swap ideas and this ability to interact with each other has been shown to drive progress at a much faster pace than in an area where they are separated. By using office partitions around each department or team, you enable them to work together without the distractions caused by other colleagues nearby, and ensure that they are able to do their jobs properly and to the benefit of the whole business thanks to greater efficiency and communication. The main advantage of office panel system, are that they are sturdy enough to provide you with fixed walls that give you all the benefits of traditional construction in terms of the solidity that they offer without any of the problems that are associated with conventional walls.